Another user submitted illusion! Thanks guys! You are what makes this site so wonderfull. Others, be sure to take Lee Wallender, who submitted this illusion, as an example, and start submitting your findings today :) As you see this billboard has different effect when sun is shinning and on a cloudy day. Can you guess how it works? If not, jump inside this article to find out! 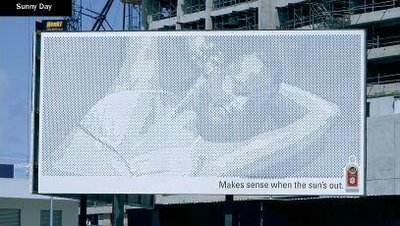 What’s interesting about this illusion, is how the billboard enlists sun/earth trigonometry in the selling of suntan lotion. Who would guessed? Imagine what would happen if someone did more of that with architecture! 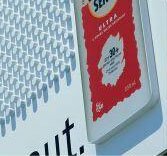 As you might have guessed, the billboard is made of 12,148 aluminium pegs, varying in length from 1mm to 27mm. Each different length peg creates different sized shadow. The different sized shadows create a greyscale image of a woman sunbathing, when the sun comes out! That is amazing. It must have taken them ages to work out all the sizes! It’s just a 5-bit grayscale highly pixelated picture. There’s a value for each pixel that dictates how big the stud should be as well. Clever. Simple. Is anywhere worse than Colorado? They shoot wolves in Colorado. Its a cool idea, but people can only tell what it means half the time! I don’t know about you, Tori, but that would work 300+ days a year here in SoCal. I would love to see something like that. No… it just has loads of bits sticking out that have different sized shadows depending on where the sun is. VDUs give you cancer, switch off!!!!! 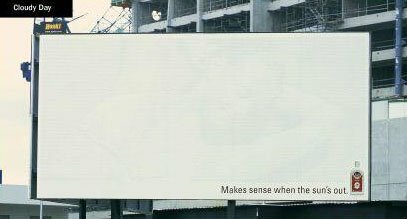 I guess the other ad people don’t like this billboard for what it’s advertising because a saw a “Cure Cancer” ad right on this page. I live in Oahu in the country. we don’t usually go to highways or freeways so me and my family don’t see very many billboards like that. If you tip your computer back (if you have a laptop) or change the angle you are viewing the picture on your computer, you can actually see the image in both pictures. Imagine how much that cost.